SOUTH AFRICA WINS INTERNATIONAL SUPERCOMPUTING CROWN – AGAIN! Just a few weeks ago there was much talk about South Africa scoring the lowest out of 148 countries when it comes to maths and science, according to a World Economic Forum report on Global Information Technology. This wasn’t something we wanted to hear considering the goal of the Silicon Cape initiative that is trying to be a catalyst for tech in the Cape. But then, there was incredible news last week. 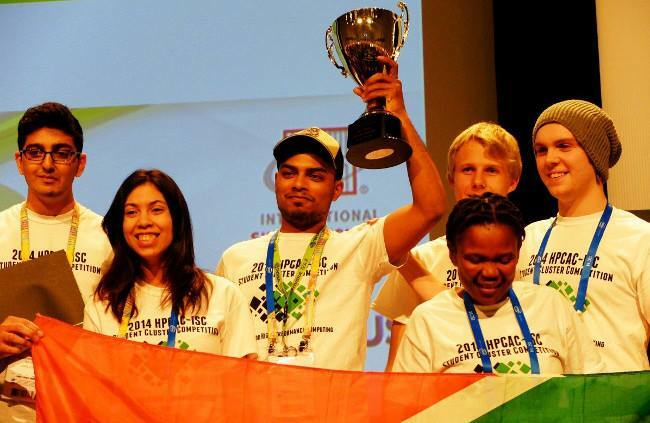 South Africa has successfully defended its championship of the International Student Cluster Competition, winning the overall prize in Leipzig, Germany. To win ISC (International Supercomputing Conference) , students have to build a computer cluster, or supercomputer, that stays within a certain cash and power budget. Within those constraints they must achieve the highest aggregate score across a suite of benchmarks, and perform well in an interview with ISC judges. The attendees at the International Supercomputing Conference were stunned as this is the first time that any team has had back-to-back victories! The South African Team of six is also the youngest as it was made up of undergraduate students only. The team selection policy for South Africa also sets us apart from the other countries in that it has not sent the same students to Leipzig two years in a row. Four of the six students are from UWC, one is from Stellenbosch University and one is from Fort Hare.